On this page we give in-depth information as well as our best tips and advice for working with the Barrelling Machine For Polishing Metal . We feature the most frequently asked question we are asked from customers when considering the barrelling machines as well as a few more we think are useful to know! This machine is one of our most popular products, and is such a good investment! If there is anything you would like to know that has not been covered on this page, please feel free to get in touch. A PDF copy of the full instruction leaflet can be found for you to download at the bottom of the page. The benefits of tumbling jewellery rather than polishing by hand. The main benefit of using a tumbler is the amount of time you will save compared to polishing by hand. You can make a batch of jewellery and tumble polish it all together, this not only saves you time but it frees you up to get on with the next task - which is particularly important if you are making your work to sell. It is able to get into the nooks and crannies that polishing mops are not able to reach. No, everything you need is in this kit! The electric motor base, 3lb plastic barrel, stainless steel shot and cleaning compound are all included so all you need to do is add water (and your jewellery of course). It is very economical to run and will only cost about a penny to run it all day! If you consider that you’ll normally tumble many items at once this will reduce the cost to a fraction of a penny per piece. The kit provided by Kernowcraft includes an electric motor base, one 3lb plastic vaned (paddled) barrel, 500g of mixed shape, rust resistant stainless steel shot, 500g of barrelling compound (barrelbrite), easy to follow instructions and a 5 year motor guarantee. 2. Add in a level teaspoonful of the barrelling compound. Barrelbrite cleaning compound (also known as barrelling compound or gallay compound) is a special soap used to keep the shot and barrel clean. It also helps to lubricate tumbling - helping the polishing action, and minimise rust. 3. Fill the barrel half full of cold water. 4. Pop the lid back on, put the barrel on the rollers and start the tumbler! As the barrel rotates the shot inside is acting like thousands of tiny hammers, planishing the surface of the metal and making it shine. It can vary, but to begin with try three hours and then check your work. If you think it needs longer, just pop it back in. Will the barrelling machine remove scratches from my work? The barrelling machine does not remove scratches - it only polishes! You need to remove any scratches prior to tumbling using files and wet and dry sanding paper. Will tumbling my jewellery work harden it? There are lots of conflicting opinions on this; however tumbling will only harden the outer layer of the metal. It would be more reliable to work harden your designs before tumbling, by either gently twisting or hammering (try the rawhide mallet as it won't mark your piece at all) your work. Can I put small findings in the tumbler, i.e. headpins and can I tumble chains? Headpins will survive tumbling unless they are tumbled with something else which they may get tangled in and bent as a result of this. It’s worth considering this when loading up the tumbler. 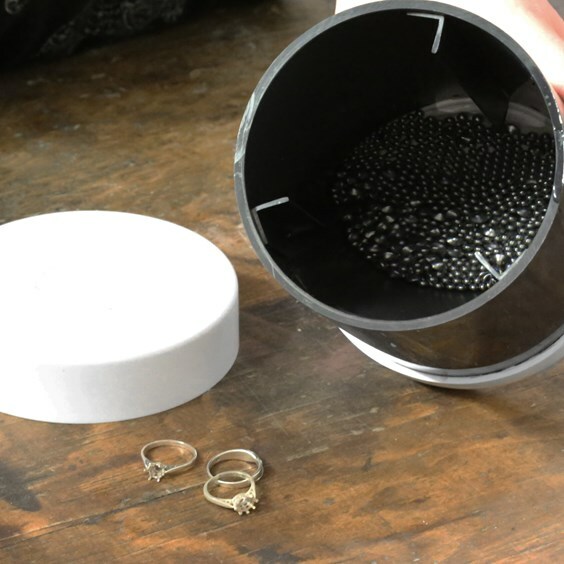 If you’re tumbling handmade findings like jump rings for example, the tumbler will remove small burrs. *A handy tip for sorting your findings from the shot* - as our shot is magnetic it can be removed with a strong magnet! You can tumble chains however you run the risk of them becoming very tangled (especially very fine chains). Can I tumble metal items with gemstones set in them? You should never tumble, for example, turquoise, amber, emeralds or pearls as this effect their finish and shine. With any other gemstones we really recommend you experiment first as we can’t guarantee they won’t get damaged during the tumbling process. Tumbling designs with set gemstones also runs the risk of getting water trapped underneath it. Can I polish stones/sea glass in with the shot? 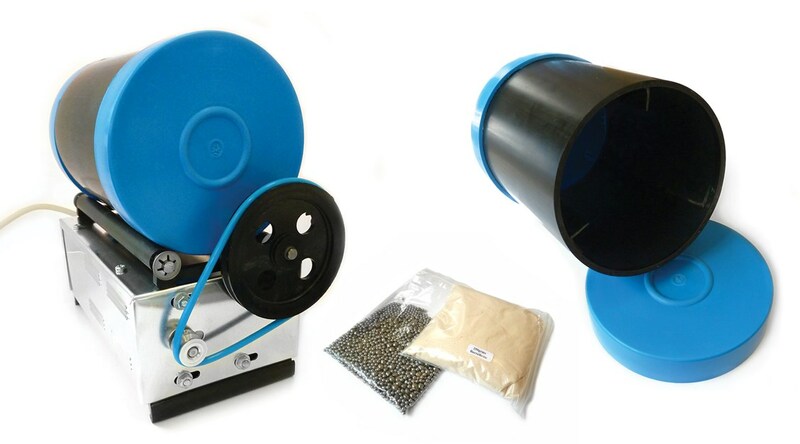 No, you’ll need to use grits and polish to tumble stones and not stainless steel shot - we have a separate machine and kit available for this - tumbling machine for polishing stones which you can view here. We highly recommend using separate barrels for shot and grits. If you are using the same barrel for both it is imperative that every single grain of grit is removed before using again for shot (this is virtually impossible). If one single piece of grit is left in the barrel it will scratch the work you’re trying to polish. It is really difficult to find one tiny bit of grit amongst the shot. It’s a risk best avoided! What if I need a replacement part after I’ve had the barrelling machine for a long time? Absolutely yes – it’s designed to run and run so will be quite alright for heavy use. I don’t have a workshop – can I use it in my house? Absolutely – the tumbler is fitted with a UK plug and can be plugged into a regular mains socket. 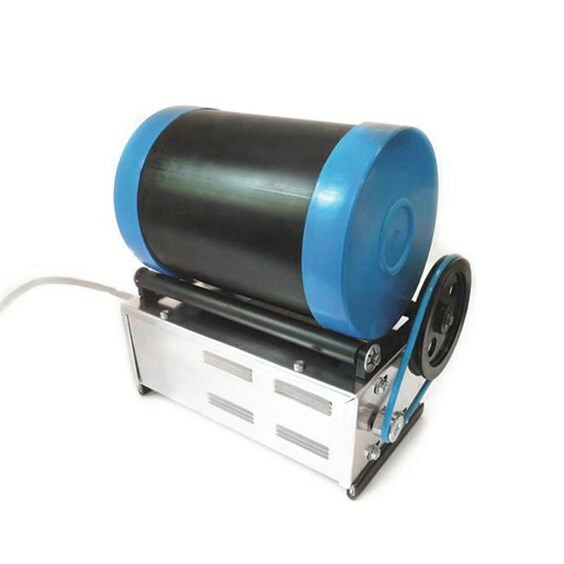 This machine has a 1.6m cable, is CE marked and complies with EU safety standards. It has rubber feet to help stop it scratching your work surface and to stop it creeping across and falling off and as it’s a fairly compact size it can easily be stored in a cupboard when not in use. How do I store the shot when I’m not using it? Although the stainless-steel shot is 100% rust-resistant steel, you shouldn’t leave it lying around wet. It should either be left immersed in the tumbler mix of water and cleaner or rinsed and dried completely. *A good tip for drying*- is to empty into a sieve, rinse thoroughly and dry in an old washing up bowl with a hairdryer! How noisy is the tumbler? Although the rubber barrels are much quieter than the plastic ones, they still emit a certain amount of noise. If you are tumbling items for a long period of time you may wish to set your tumbler up in a utility room or similar to minimise noise levels. Do I need any safety equipment and is it dangerous to use? It is not necessary to have any safety equipment when using the barrelling machine for tumbling metal, however you must make sure any loose clothing, jewellery or hair is tied back out of the way so they don’t get caught around the roller. As with all electrical equipment, don't get the motor part of your tumbler wet and don't touch it with wet hands. The motor is a low-speed, long-life design which won’t overheat if you leave it unattended but it is always best to unplug it when not in use or when it’s being serviced. Can I put fired pieces of metal clay straight into the tumbler? It is fine to put fired pieces of metal clay straight into the tumbler - just make sure they’re finished to a standard you’re happy with as the tumbler won’t remove any scratches or deep marks from filing etc. Can I put hollow items in the tumbler or will they get damaged? As long as they're not too delicate they should be ok - again we would really recommend doing a test before you put a finished hollow piece in the tumbler. You might also find that stray shot will find its way into the item if there is a hole in it, so bare this in mind also. It can be easily removed by rolling the piece or using a magnet to get the shot out of the hole. Can I put items with a hole drilled in them in the tumbler? Yes that’s fine – if you do find some shot managed to work its way into the hole then you can try shaking it, gently dropping it onto a magazine or similar soft but firm surface to dislodge it or using a magnet to get it out. If you would like to read more information about polishing metal with a barreling machine you can download the PDF instruction leaflet here.